Rain Acoustic Duo: Time flies by when you're the driver of a train... or not.. as the case may be. Time flies by when you're the driver of a train... or not.. as the case may be. How long since the last blog post????? Gosh, we've had such a busy time of it catching up with the blog has been the least of our worries..
From releasing the CD, its been a steady stream of gigs, working on other projects and well, generally being very very busy!! We're not complaining, no, we're not. Its good to be busy. Well, a welcome return for us at The Boughey, always a good night, and this one definitely was.. A favourite of ours, as well you know.. The Gresley held their usual Folk and Ale Festival, but this year arranged the event themselves, we were there along with Esther Brennan, sharing her new toy with us as part of Brennan and Buchanan, always very lovely to see them and the evening was taken by ever wonderful Slippery Hill Boys.. so all in all a great little festival, well attended, the sun was shining and the beer flowing..
First time for us at The Fox in Elworth. A delightful venue with a lovely crowd and a very welcoming manager. We're not their usual kind of act, but that's OK, as you take a chance sometimes and sometimes it pays off. Was a nice place to play. Returning to the White Hart, in the middle of the World Cup.. the White Hart, usually teeming with people took a while to fill up, but it did eventually.. Our usual friends were in and it was delightful to be able to play some requests from last time for them, which, as you would expect, went down really well! Back there in December folks..
Michelle, who manages The Royal Exchange is an amazing lady, she worked so hard to put together the Beer Festival at St Dominic's Centre in Stone. She really deserved the award she has just won for her pub.. Anyway, we played during the afternoon, we should have played outside, but opted for inside due to the weather looking a bit ropey. As I said, we should have played outside, because the sun came out and everyone sat outside.. not because of the music, but because it was such a lovely day!! Never mind.. we enjoyed playing there anyway and it was nice to see a few folk singing along as well plus a few faces from the Lymestone Brewery Festival earlier in the year.. So nice to be invited back to play the Alsager Festival, which is an absolute 'must go to' event for anyone who loves music.. There was 4 stages this year, the acoustic stage, the main stage, the Greenway Stage and the SOPHIE stage.. each one delivering different music to different audiences. 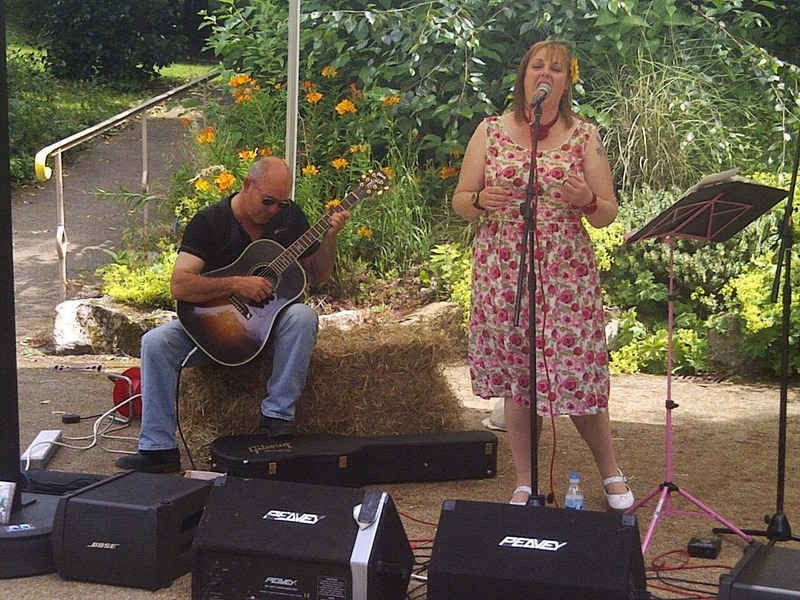 Here's picture of us doing what we do at Alsager.. spot the flowery dress, cos it was hot and sunny again!! Its a free event, with loads of things to see and do.. so is a must for families.. Really looking forward to 2015's event too!! You know when you book something months in advance and you get a reminder a couple days before.. well that is what happened to us!! I thought the gig had been cancelled by Graeme, Graeme couldn't remember and luckily the very lovely Sam called me and asked if we were still free.. Of course we said "yes" and promptly threw the gear in the car for a lovely night out at The Red Lion.. We threw in some more new songs and had a jolly good night.. We all enjoyed it and we'll be back in September! Shh, don't tell anyone, but did you know, in our spare time and when we're asked, we can be available to run Open Mic/Acoustic Nights.. The very lovely Paul Gibson asked if we wouldn't mind running it, and how could we refuse? We love The Greyhound and had a stonking night in there, loads of players turned up and made it a night to remember. I've told you before about how much we love the Boughey.. well, we were invited back to play.. so , again, we couldn't refuse.. etc etc.. A lovely night, as it was also the bosses wife's birthday, so she was in with her friends, singing along to the tunes we played and generally having a brilliant night..
Organised by the ever lovely Slippery Hill Boys as a thank you to the landlord of The Red Bull, Church Lawton, we were invited down to do a set in the sunshine, by the canal. Made a real change sitting under a parasol, sipping a cool drink and watching the boats go by as we were listening to the dulcet tones of the SHB.. A few other acts joined us, a lovely girl called Emily, who writes her own songs, the very lovely Graham Dawson, who was joined on stage by SHB, which filled out his songs brilliantly.. and Hayley Strangelove and Baxter.. who were their usual boisterous selves..A really lovely afternoon, chance to catch up with a few folk and sit basking..
More to come.. when we've played them..